the occasional break-out hit (the biggest being Donald Duck), most of their characters came and went and were never seen again. This particular Silly Symphony concerned a young boy's adventure in the woods. Hiawatha, no known relation to the hero of H.W. Longfellow's famous poem (and even less to the Hiawatha who once hunted Bugs Bunny), ventured forth with his little bow and arrow, intent on emulating the mighty hunters of his village. It turned out he was too soft-hearted to kill a rabbit, but that was okay — later, when he was endangered by a ferocious bear, the rabbit rounded up an animal posse and saved him. Hiawatha returned home safely but empty-handed. The director was David Hand, who had earlier directed the Oscar-winning Silly Symphony Three Orphan Kittens. Hiawatha didn't speak; hence, no voice credits. Three years later, Hiawatha turned up again, this time in the Silly Symphonies newspaper comic, which was distributed by King Features Syndicate. From November 10, 1940 to July 12, 1942, writer Hubie Karp (The Fox & the Crow) and artist Bob Grant (who had assisted Hank Porter on the comics adaptation of Snow White) used it for gags about Little Hiawatha. These didn't adapt the cartoon, but did a self-contained story each Sunday, usually without words, about the little boy's doings in and around the village. It was in this sequence that Hiawatha's girlfriend, inevitably called Little Minnehaha, was introduced. She'd originally been designed (by Walt Kelly of Pogo) for a Silly Symphony that was never produced. There was talk of a feature right about then, but nothing came of it beyond a little preliminary work. Some of the Sunday comics were reprinted in Dell Comics' Walt Disney's Comics & Stories in 1943. The following year, that title printed a handful of stories in the 8-10 page range about Minnehaha, written and drawn by cartoonist Roger Armstrong (Mary Jane & Sniffles). These were written in the four-beat, rhymeless cadence of Longfellow's poem, but didn't scan as relentlessly. Then Hiawatha disappeared for a few more years. He was next seen in Walt Disney's Comics & Stories #143 (August, 1952), which launched a regular series for him in the back pages. Several writers and artists handled his series, but none did outstanding work on it. After pantomimes and stilted rhythms, this was the first time Hiawatha spoke normally, and the result was a lot of insultingly stereotyped dialog. Hiawatha's father, usually called Big Chief, was fat, lazy and not very bright. This series introduced Hiawatha's younger sister, Sunflower. Another character seen in it was Li'l Davy, an obvious attempt to cash in on the popularity of Disney's stories about the American frontier hero, Davy Crockett. This Davy started out as a supporting character in Mickey Mouse's daily strip. But the times were against this sort of treatment of minorities; and when, following its 168th issue (September, 1954), Walt Disney's Comics & Stories was cut from 52 to 36 pages, Little Hiawatha and Grandma Duck were both given the axe. He didn't disappear completely, not for a while at least, but after four appearances in Dell's Four Color Comics series (the last dated July, 1959), he was gone. In America, at least. 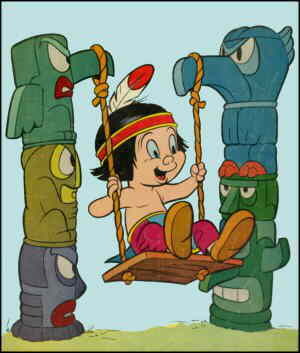 It's been nearly half a century since Little Hiawatha has been seen in the country he's a native of, but he still turns up reasonably often in European comic books. One secret of his success there might be that he's treated as a human being, not a stereotype. Text ©2004-05 Donald D. Markstein. Art © The Walt Disney Co.